How about with this: I haven’t laughed at many comedies or many films in general this year as much as I have done at Sausage Party. I had been looking forward to this one from the very first viewing of that filthy-as-hell trailer online, and each new slice of footage that debuted only got me more and more excited, to a point where I honestly hadn’t felt this hyped for a film since Star Wars: The Force Awakens. Like with that film, my expectations were not only met, but it gave me an extremely enjoyable viewing experience that I will cherish for the rest of the year. And it’s all about a talking sausage voiced by Seth Rogen. Rogen and his chums, which include but are not limited to Jonah Hill, James Franco, Michael Cera, Danny McBride and countless others, all lend their voices to a bunch of supermarket products, who live in bliss as they eagerly await to be taken to the “Great Beyond” by human “gods”. Frank (Rogen), a sausage, is particularly excited as being taken there will mean that he can get all up in his hot dog bun girlfriend Brenda (Kristen Wiig). However, when a returned jar of Honey Mustard (McBride) tells everyone that they are being lied to and that the “gods” kill and eat them once they leave the store, it springs into motion a store-wide adventure that sees Frank, Brenda, and their new friends including a lesbian taco (Salma Hayek) and a squabbling pair that consists of a Jewish bagel (Edward Norton) and a Middle-Eastern lavash (David Krumholtz), discover the truth for themselves. The advertising promises a raunchy, foul-mouthed and utterly hilarious cartoon adventure for adults, and that’s exactly what it delivers. From the very first few lines including a delightfully twee Alan Menken musical number (yes, THAT Alan Menken), you’ll know exactly the kind of film you’re in store for, and Rogen et al have an absolute blast riffing on the typical Pixar tropes and taking advantage of its animated environments and lack of limitations. The animation itself is very nice and colourful, and I need to credit each one of these animators – even if the creators allegedly won’t – for taking something that was always not meant to be taken seriously, and putting a great amount of effort into making it all look extraordinary on the big screen. At first, it may seem like it’s just a whole load of f-bombs, food puns, and some VERY suggestive innuendos (“Look how tight I am,” Brenda playfully teases as she’s caressing her middle split), which are already pretty funny, but trust me when I say that it gets even better. At its core, Sausage Party contains one giant allegory for religion, and like Life of Brian it satirises the absurd levels that we all go to in order to express our own beliefs, even when they don’t even match the original intentions of its founders. Though most of the store believes in an eternal afterlife, others such a Sauerkraut that’s modelled after Hitler have twisted it for their own nefarious purposes, in this case for him to exterminate the “juice”. There’s also a wonderful ribbing of the Israeli-Palestinian conflict with Norton and Krumholtz’s characters, with the latter also describing his belief that in the “Great Beyond” there will be 72 bottles of extra virgin olive oil waiting for him, while the both of them argue about the unfair occupation of an aisle that’s apparently impossible to share. The way that the film approaches its very difficult target is rather inspired, and the fact that it’s done so intelligently and without painting such a black-and-white portrait of the concept as a whole just makes it all the more impressive from a writing standpoint. As well as being both hilarious and surprisingly smart, the script also really manages to get you invested in the characters, as most of them are actually rather likable with their own distinct personalities. Sure, they may be stereotypical, often to an intentionally offensive degree – there’s a bottle of Firewater (Bill Hader) who acts and sounds like a Native American tribe leader, a box of grits called Mr. Grits (Craig Robinson) who seems to be a Blaxploitation lead with a serious distaste for “crackers”, and that’s only a couple of the characters – but not one of them comes off as a mean-spirited representation of a particular ethnicity or sexuality, and they are memorable and funny enough to really make you side with them as the film goes on. However, since they are depicted so stereotypically, albeit to a humorous effect, I would say that this film is definitely not for the easily-offended, as this is a purely adult animated film that will go down in history along with Fritz The Cat and South Park: Bigger, Longer and Uncut as being one of those films that set out to lovingly offend with a few pencil drawings, or in this case a whole load of computer graphics. If you can indeed handle a little bit of adult humour on this scale, then you – like me – will find yourself absolutely enamoured with the levels of comedy on display in Sausage Party. I laughed considerably all throughout, and even when I wasn’t I was just sitting there smiling, knowing that I was in good hands for the rest of the running time. Not once did a joke bomb for me, not once was I ever bored, and not a single time did I entirely know where it was all headed, but the strength of the story and the likability of the characters really kept me wanting to know what was indeed going to happen. What DOES end up happening needs to be seen with your own eyes, but I hadn’t laughed like that at any film, regardless of its genre, in months and even years before seeing what was going on up there on that screen. The imagery will stick with you for days, based purely on how hilariously outrageous it is, and I’d like to think that it will surely live in animation infamy as being one of the most insane things to ever be constructed by hundreds of digital artists. 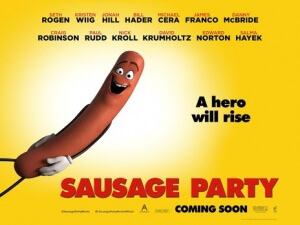 I’m going to declare right now that Sausage Party is my favourite comedy of the year, as I find it unlikely that over the remaining few months of the year I will come across a comedy that is smarter, sweeter, and most of all funnier than this one. It may be an acquired taste, but anyone with that appetite will absolutely eat it up (puns well and truly intended). Sausage Party is one of the funniest, smartest and even sweetest comedies of the year, blending some wild and outrageous animated imagery – including a climax that will leave your mouth wide open – with some thoughtful and debatable allegories for religion.